Italian cross-country star Giorgio Di Centa (37) has his eyes fixed on gold. If his results at the Winter Olympics are good, his next goal will be to end his career with a World Championship gold at Holmenkollen. On Friday 9 October, a delegation from the FIS inspected the new network of ski tracks at Holmenkollen. The old ski hero Vegard Ulvang, who chairs the FIS cross country committee, was extremely happy with the layout. Lasse Ottesen, the former Norwegian national team ski jumper, becomes the Assistant Director of Sports at the 2011 WSC. Lasse Ottesen and Espen Bjervig, the Director of Sports, will work together to make sure that the best possible sporting conditions are in place. They will also assist the race directors and offer services to the ski teams. The board of the FIS has decided that there will also be a team competition for men on the small hill. 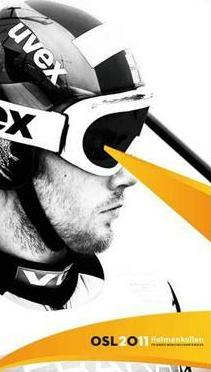 This means there will be four ski jumping events for men at the 2011 World Championships. “We are happy that even more people will have the chance to see ski jumping at Holmenkollen. We have already noticed great interest from the public,” says Ski-VM 2011's Director of Sports, Espen Bjervig. Why is Holmenkollen the third best known sporting arena in the world? Only Wembley and Wimbledon are ranked ahead of us, while Madison Square Garden and all the other sporting arenas have fallen behind. It is hardly the ski jumping hill with its 18 reconstructions and continuous dispensations from the regulations which has created this success. No, it’s the spectators, culture and expertise which lie at the root of this reputation. For the skiers, WSC 2011 is the icing on the cake! The cross-country skiers have three main goals ahead of them, of which the Nordic World Ski Championships is the last and the one they look forward to the most. Chief of Sports for cross-country, Åge Skinstad, encourages the spectators to come to Holmenkollen. This may encourage the Norwegian skier to go up to 30 seconds faster. The ladies ski jumping team of Norway is on track for the WSC in 2011. They look forward to the extra attention and atmosphere in Oslo. Naturally, they also dream about success on home ground. After a successful World Cup at Holmenkollen on the 8th and 9th of March, with three Norwegians in the top six places, it is now two years until the athletes can compete in ski jumping and cross-country skiing in Oslo. Both Nordic combined athlete Espen Rian and sport chief Bård Jørgen Elden are looking forward to a Nordic World Ski Championships on home ground.